We found that packing Minnie Pearl in the bitter cold of this winter has been very challenging. Temperatures were below 10 degrees most of the time. 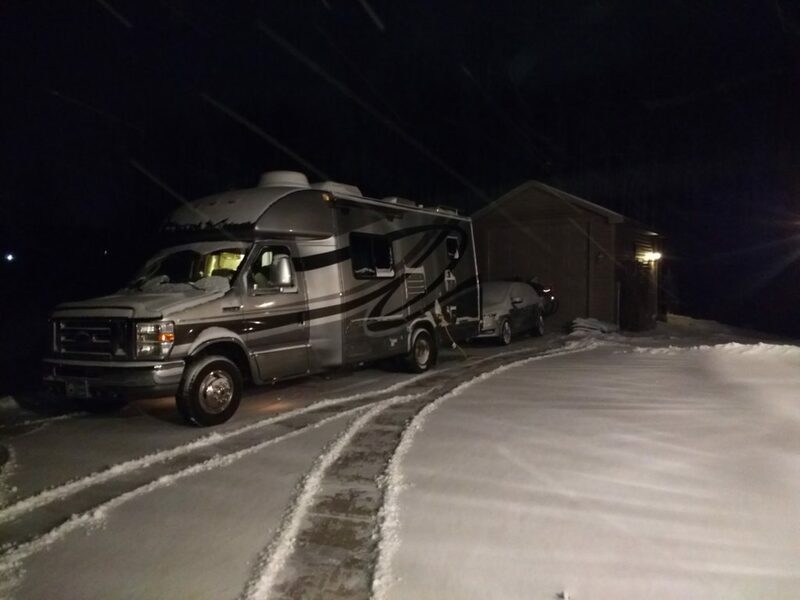 We were afraid to put too much in the camper for fear of it freezing. So that left most of the packing to be done the last 2 days before we departed. Hooking up the toad with bare hand – not fun! Day 1 of Packing – not smooth sailing! We pulled the camper out of the shed and we noticed that the tires needed air. We proceeded to put air in the tires during the bitter cold. However, when filling the third tire it was so dang cold that the air compressor hose snapped. It was very startling because it let off a loud bang. The wind chill was below zero so we decided to try to call a local service center in the nearby town to see if we could get them to put air in the tires. They said sure, bring it on in. We should have thought of that in the first place! Now all the tires were properly inflated. We got back home and continued our packing. About an hour later we noticed that the right front tire was extremely low and undriveable. So, we spent the next couple of hours driving around town to try to find parts to fix the air compressor. Meanwhile, time was ticking away, and this was not how we wanted to spend the last two days of packing. It was late afternoon and we were finally able to inflate the tire. We kept a close eye on the pressure but noticed it had lost about 10 pounds. We could feel air seeping out and it seemed to be near the valve stem extender. We called the shop back, but they couldn’t fit us in the next day. So, we called a brand-new shop in our town and they said they could look at it immediately. By now it was close to getting dark! We were happy to hear that it was just the valve stem extender that was leaking! We were ecstatic to find out that there was nothing wrong with the tire and that all we had to do was take off the valve stem extender. We also learned that they can service our motorhome and the garage could accommodate the 10 ft height. So despite all the tire trouble, something good came out of it! We got on the road Friday morning around 6:45 a.m. The temperature was -3 degrees and we had had 2 inches of fresh powdery snow. 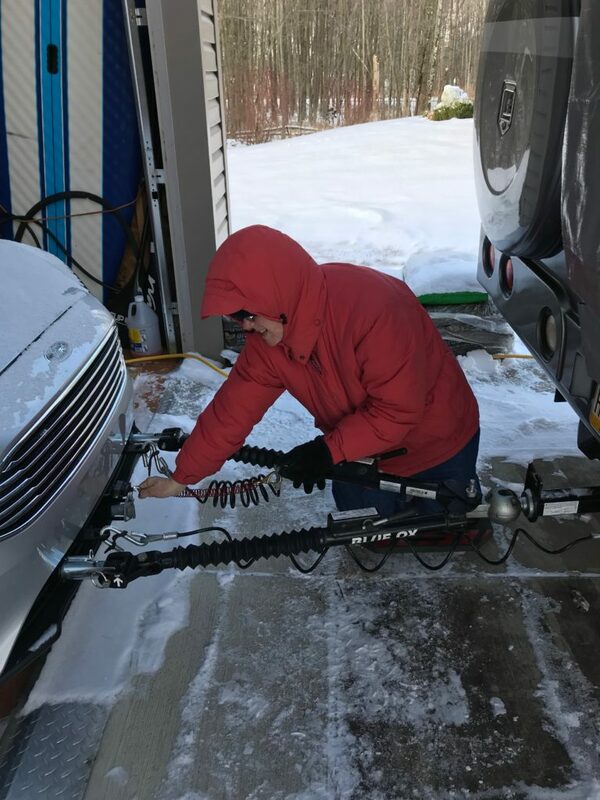 Linda shoveled a pathway to make packing a little easier. It was still snowing for the first hour or so of our trip but the drive wasn’t bad. We had some very wet roads with lots of salt when the trucks passed us we got splashed very bad. Minnie Pearl needs a bath! We were lucky to have a decent driving day. 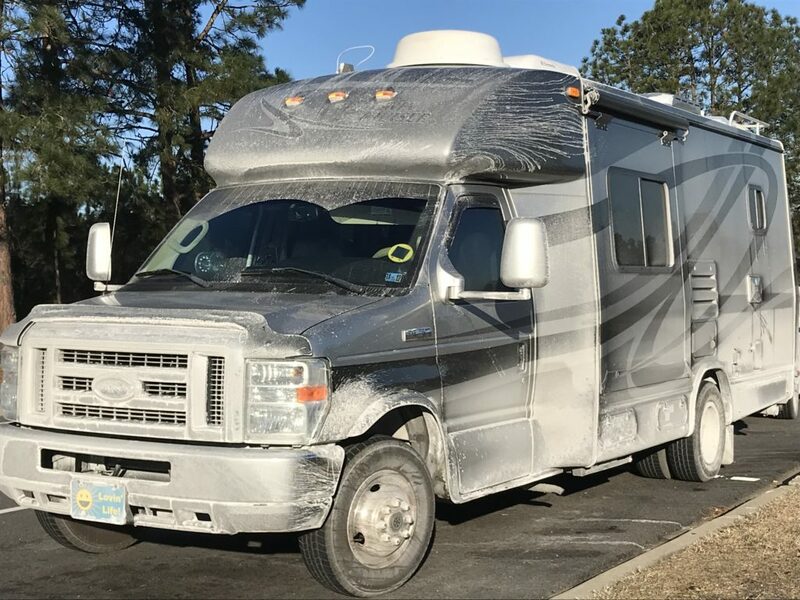 The salt on the vehicles will wash off. 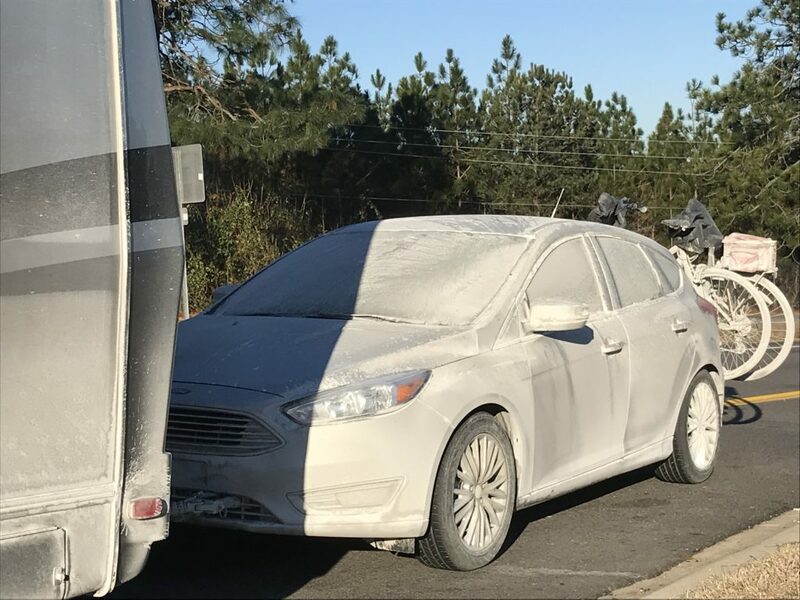 Our silver Focus is now white from all the salt. We drove a lot through the mountains and going up and down the hills and drove about 420 miles. We stopped for the night at a campground in Elkin, North Carolina where we had made reservations. It was a very small campground with only 11 sites. It is part of a farm and there were cattle mooing at Heidi when we took her for a walk. Since we had electric at the site we were able to use our little electric quartz space heater and keep warm overnight. Our campsite at the Byrd Branch Campground in Elkin, NC. There was only one other camper in the campground. Day Two and We’re Off! Day two started with our morning temperature being 4 degrees. It was a nice day for a drive and we enjoyed the temperatures rising throughout the day and the sun was shining! When we got into Georgia the temperature was in the low 40s. It felt like summer to us after all the bitter cold we have been living through. We stopped at the Georgia Welcome Center to have lunch in our RV. Heidi enjoyed going for a walk in the warmer temperatures and being able to see the grass again. Our ground had been snow-covered most of December. We arrived at our friend’s house in Palatka, FL and were warmly welcomed. We will be staying here a few days before heading down the road on our next adventure. It felt great to be in warm, sunny FL even though the temperatures are below normal. 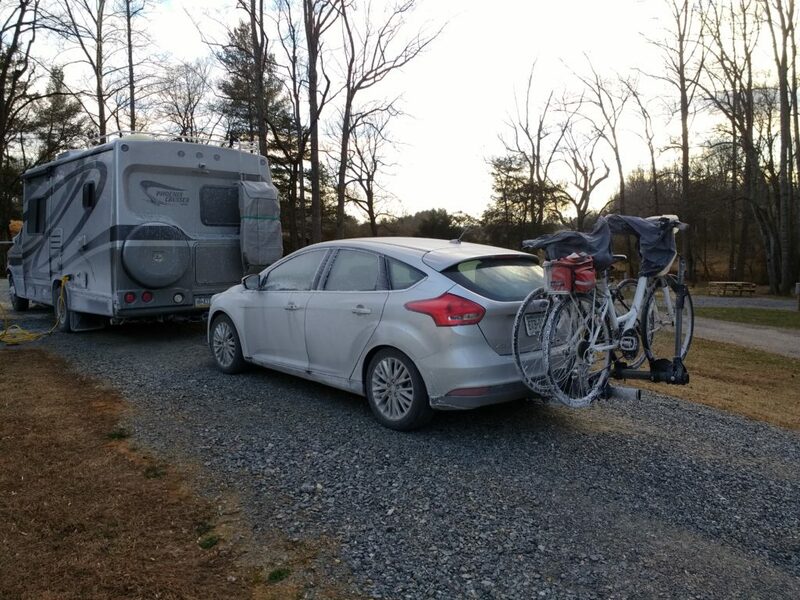 This entry was posted in Florida, Getting Started and tagged Byrd's Branch CG, Elkin, NC. Bookmark the permalink.